Bartolomeu Dias, or Bartholomew Diaz, was born around the year 1451,the son of a Portuguese nobleman. Very little is known about Dias's life, but as an adult, he became a Knight of the royal court, the superintendent of the royal warehouses, and the captain of the ship, Sao Cristovao. Dias was married and had two children: Simao and Antonia Dias. After Marco Polo came back from the East, Europeans started looking for ways to travel to the East without travelling through any Islamic kingdoms. Europeans wanted to find both spices and precious metals. Also, they wanted to find Prester John. Prester John was a supposed Christian ruler of the East who would serve as a powerful ally against the Muslim nations, something that Europeans desperately needed during the Crusades. 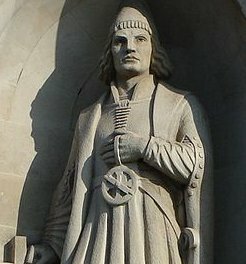 On October 10, 1487, Bartholomew Diaz was appointed by King John II of Portugal to sail around the southern tip of Africa, which had not yet been discovered by Europeans, and to search for Prester John. Diaz sailed out of Lisbon that same year, hugging the African coast the entire way down. As he sailed, Diaz completely missed the southern tip of Africa, so he decided to go straight on to India. Diaz, unfortunately, was forced to turn back after his crew refused to go any further. On his way back, Diaz landed at the tip of Africa, naming it the Cape of Storms. King John II later named it the Cape of Good Hope. Diaz later helped in the construction of Sao Gabriel and Sao Rafael, the two ships that held Vasco da Gama, the first European to sail all the way to Asia. Bartholomew also sailed with da Gama on the first leg of his voyage to India, though he did not travel the entire way. Bartholomew Diaz sailed with Pedro Alvares Cabral on the expedition which discovered Brazil. After the ships turned around and sailed to India via the Cape of Good Hope. On May 29, 1500, at the Cape, a violent storm hit the ships, wrecking Diaz's ship, probably killing him in the process. Diaz is on our list because he discovered that Africa actually had a southern tip. His maps provided the basis for the expeditions led by Vasco da Gama and Pedro Cabral.